At Bigham the Mover we use specially designed wooden containers (also known as pallets) to store all of your household items. 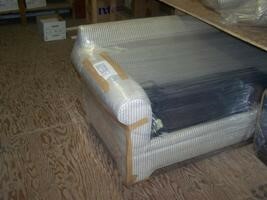 All of your furniture is wrapped in a quilted furniture pad for protection before being loaded into the container. All of your mattresses and box springs are protected in a plastic mattress bag and any upholstered items are wrapped in protective plastic wrap. All upholstered items are stored in our organized racking system in our storage facility. All upholstery will be completely wrapped in a protective plastic wrap and labeled with an inventory tag. All upholstery has its own section in the racking system and is easily accessible. The use of the racking system ensures that there will not be any potential stress or pressure placed on the fabric or leather. Our storage process allows us to minimize the amount of times your household items are handled. Our wooden storage containers are loaded directly inside our truck at our storage facility with a forklift. Our team will start the process by taking a complete inventory of your items. We will then load your household items directly into the wooden containers at your residence. 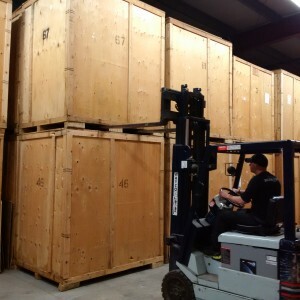 The loaded containers are unloaded from the truck with a forklift and placed in our climate controlled storage facility. The same process is used when it is time to unload your items at your new residence. During the entire moving and storing process your goods are only handled twice. This process allows for a very efficient move in comparison to other storage locations where your items will need to be completely unloaded from the truck and then reloaded for delivery to your new home. Our moving and storage service also eliminates the extra handling of furniture which reduces the potential of damage. Our storage facility is climate controlled and is protected by a monitored security alarm system. The wooden containers that your goods are stored in are kept in neat rows in our storage facility. If your household items will be in storage for a prolonged period of time, it is very important for you to keep out items and/or articles of clothing that you will require from one season to the next (such as winter coats / sweaters, summer shorts / t-shirts). Access to your goods, although feasible, is not a quick or immediate process. Therefore, the above guidelines are extremely important to keep in mind. Refrigerators and freezers must be emptied, drained, dried, and cleaned for any move to storage. No live plants or perishable food items are admissible. Lawn mowers, weed eaters etc. must be completely empty of fuel and no gas cans (unless new, and unused) can be brought into storage. Flammables such as household paint, varnish, thinners, gasoline, kerosene, oil, bottled gas, aerosol cans, nail polish and remover, ammunition and explosives, corrosives, bleach, lighter fluid, propane tanks of any kind, oxygen bottles / tanks, fireworks, matches, automotive repair and maintenance chemicals, and combustibles of any kind cannot be stored.